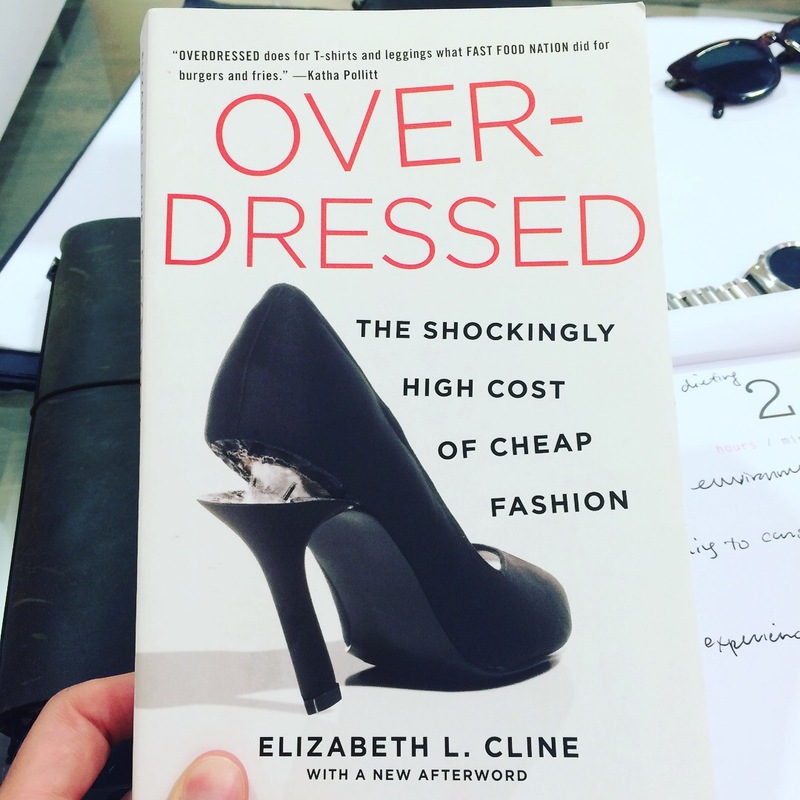 Marc Bain penned those words in an article in Quartz in 2015, and they speak to the subject of this post, a review of a book every person should read: Overdressed: The Shockingly High Cost of Cheap Fashion, by Elizabeth L. Cline. When I left Milan after 16 months in business school, my friend Hilary Walker gave Overdressed to me. She is the owner of BIVIO, a second-hand reseller in the Italian fashion capital. I didn’t part the pages of this fantastic, enlightening book until recently, but it has reaffirmed my excitement toward thoughtful consuming. The book is relevant to all consumers, since we all wear clothes (except for those lucky nudists!) and must periodically purchase them somewhere. But we do have a choice by the way we choose to spend our clothing budget. Ms. Cline chronicles the dramatic change in the clothing industry over the past 30 years and the effect it has had on our shopping habits, attitudes toward garments, the environment, and the labor force. She makes an excellent case for buying quality rather than quantity, and taking care of the clothing you buy. Fast Fashion refers to a model pioneered by companies like Inditex (owner of ZARA) and H&M. It is clothing produced quickly, regardless of season, in trendy colors and in styles often lifted from the runway looks of more expensive designers. For super cheap. Think $5 for a skirt, thanks to production using inexpensive fabrics and grossly underpaid labor in poor, no-better-options countries like Bangladesh, Sri Lanka, Vietnam, and the Dominican Republic. Others have followed, of course, in order to keep up and compete, and chase Inditex’s fantastic profits. The habits are industry-wide now. Ms. Cline covers all of the stats and numbers in her book. The result domestically is the almost total loss of American apparel manufacturing jobs and infrastructure. In the countries of outsourcing, workers have a job, yes, but are often paid below minimum wage, subject to poor, often dangerous working conditions. Around the world, with few exceptions, all of this expedient, inexpensive fashion has turned us into uneducated, unconscious consumers of product that doesn’t fit us, bores us quickly, and saddles us with waste. It also floods charities, donation boxes, and landfills. Some of it even makes it to Africa packed in tight bales, picked over and then left on the street. OH, and unlike cotton or wool, natural fibers found organically in the earth’s ecosystem, plastics like polyester and nylon are biodegradable in any reasonable timeframe (something like 100 years). We’ve all been conditioned, through clever marketing, to consume often, interpret low prices as good deals, and opt for the convenience of trashing clothes that are no longer wearable instead of mending or repurposing them, which was common in times before cheap imported clothing. Maybe you’ve heard these things before, and you feel it’s unavoidable to shop in stores that sell these sorts of garments—quick, fast-food bites of apparel. I’m here to tell you: NOT TRUE! Italy is where I learned to scrutinize apparel labels, spot fabric compositions just by touch and feel, appreciate the second-hand market, and understand more about custom-made clothing, often called bespoke. Across 30 years of shopping and browsing, I have also learned this, a quote from Overdressed: “Our most rewarding experiences with clothing have nothing to do with walking into a store or spending money.” If the moment of acquisition is the height of pleasure during the lifetime of an item you buy, how sad is that? The truly enjoyable aspects of our wearable personalities is the confidence we feel when we look in the mirror, the compliments and attention we get from strangers and friends, and the care and attention we give to tailoring garments to be just right, repairing holes and tears, and realizing the full potential value of an item, such that when its life is truly over, there is no sensation of waste, figuratively or literally. A new way of consuming that is popping up all over the world, including in cities like Tampa, is Slow Fashion. Like the slow food movement, it’s one in which origins and ingredients matter. Many independent, ethical, and eco-friendly designers have popped up in markets, at a high-fashion level, and even in couture. I have, out of necessity, been in slow consumption purgatory for the last six months, with little disposable income to devote to new clothes. While I have never been a fan of cheap anything really, I did previously consume often and with some imprecision at second-hand stores and during seasonal sales, the products I have later sold to make money or simply because didn’t like them enough to keep. This period of acquisition celibacy has actually taught me much about which items in my wardrobe are most functional, which styles I can lean on often, and how tailoring and mending come in handy. Cut to me splitting the side seam of a pair of cropped Prada twill trousers (that I bought second-hand to begin with), then having them repaired flawlessly by my dry cleaners. 1. Buy clothes you 110% LOVE. 2. Don’t buy too much. 3. Make great use of what you do buy. Learn how to sew in order to create “DIY” garments. This isn’t for everyone of course, as it can be very time-consuming. Patronize vintage, resale, or consignment shops, like I did so much of in Italy, if getting a shopping fix at a relatively low cost is necessary. Prioritize eco-friendly fabrics made of organic materials and dyed in a non-toxic manner. Look for American-made products that support domestic, living-wage labor, or ethically-made products from elsewhere, with transparent supply chains and documented standards. And, seek out and support local independent makers of garments, handsewn with fabric, thread, and a sewing machine, the old-fashioned way. Develop a relationship with that designer, and create custom designs collaboratively. If you’re like me and enjoy the high-end, more intensely scrutinize which items are worth their cost, which are investments with longevity, and which are best watched until sale season. The English males: I’m in Giorgio Armani felted cashmere coat (second-hand from BIVIO), Care Label olive trousers, Bottega Veneta boots, and olive green Prada tote bag (purchased on sale, my one that year). The possibilities are endless, and steps small but meaningful, if we change the way we think about our clothing + vote with our dollars. The urge to always have something new is a hard one to resist (I am guilty of that when I have the means). But investing in timeless quality, taking care of it, and cherishing it over time will ultimately better serve your style, your finances, and the sustainable realities of our current world. Visit the Overdressed website to learn more about the book, where and how to purchase it, as well as resources for shopping more consciously. Follow me on Facebook, Twitter, and Instagram for more content like this. See my Pinterest board of Ethical Style for links to brands, designs, and resources.